If you're a fan of fast and sporty sedans that are built to last, then you'll want to definitely consider checking out the 2017 Subaru WRX and WRX STI models in Kansas City MO. Featuring high-end technologies and high-powered engines, these modern marvels were designed to impress. 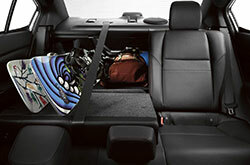 In addition, each car offers state-of-the-art safety features to keep you safe on any road. Find out more about this fascinating car by reading our 2017 Subaru WRX review below. This year, Premium and Limited trims are once again offered on the Subaru WRX. The all-new 2017 Subaru WRX in Kansas City comes standard with automatic climate control, a trunk spoiler, 17-inch alloys, a traction monitor, iHeart Radio, a boost gauge display, a flat-bottomed steering wheel that tilts and telescopes, and steering-wheel audio and phone controls. Also standard is SiriusXM Satellite Radio, iPod control capability and Pandora smartphone integration. For easy visibility and display, the car comes with a 6.2-inch Multimedia system. Amenity continues on the Limited trim, where you'll find an 8-way power driver's seat, LED low-beam headlights and Welcome Lighting. 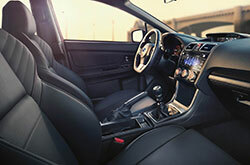 In the STI, you get a slew of other extras like leather and faux-suede seating and dual-zone climate control. In addition, there's push button start, keyless entry, a moonroof and the STARLINK 7-inch Multimedia Navigation system, which has been praised in several 2017 Subaru WRX reviews. Both the WRX and STI are powered by a turbocharged four-cylinder engine, which is matted to an all-wheel-drive powertrain. 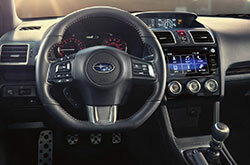 The WRX is offered with either a 6-speed manual or a continuously variable transmission (CVT), while the STI only comes with a manual configuration. 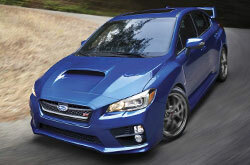 The standard WRX comes with a 2.0-liter that generates 268 horsepower and 258 lb.-ft. of torque. For the most power, the 2017 Subaru WRX STI in Kansas City is the way to go as its 2.5-liter turbo/intercooled BOXER motor turns out 305 horsepower and 290 lb.-ft. of torque. Every WRX model comes standard with a driver knee airbag and a rearview camera. EyeSight Driver Assist technology is now available on the new 2017 WRX Limited. There's also Adaptive Cruise Control, Pre-Collision Braking, Lane Departure Warning and Reverse Auto Braking technologies available on this model. 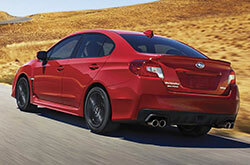 Sporty, safe and fun-to-drive, the WRX is everything you've ever wanted in a four-door sedan. 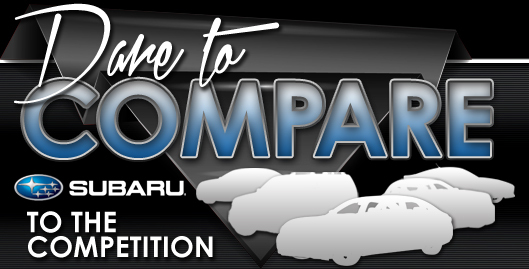 Stop by Van Subaru today for a test drive. If you live in the Kansas City area and have been considering a new car like the 2017 Nissan Sentra NISMO, Volkswagen GTI and the Ford Focus RS, we propose you take a quick look at the 2017 Subaru WRX. Its on-board technologies and finely crafted exterior styling might just seal the deal if you're looking at multiple cars. Once you're wrapped up with our 2017 Subaru WRX review and compare page, check out hot-off-the-press Subaru finance and lease offers. 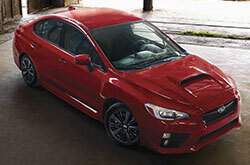 To see a topflight selection of cars, come to us to find manufacturer incentives on the fashionable Subaru WRX. Note the details that you found pertinent after reading over our 2017 Subaru WRX review; those are the points that will keep you from making a purchase you later regret. Stop by to be thankful for a test drive at Van Subaru, where you can explore the Subaru WRX upfront. Also, before your visit, you can see its chic interior from all ends by looking at our video clip.